This condo provides the modern home for a couple relocating from a historic traditional home in Evanston to a contemporary Chicago high-rise. We employed a sophisticated design strategy that features a floating staircase and eco-friendly fireplaces. 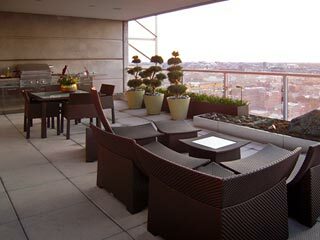 The 500 square-foot exterior terrace provides the features of a suburban backyard without the maintenance.